As it happens, there are at least three "one degree from my parents" connections. 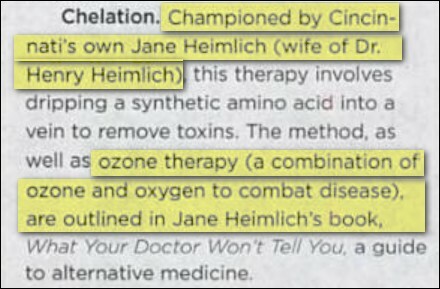 1) Per a May 9, 2002 article the Indian Hill Journal -- a suburban Cincinnati paper -- my father used Rotary to help promote his claims that malaria could cure AIDS. ...Wondewossen says that the researchers involved in the study are not doctors. He refuses to name members of the research team, because he says it would get them into trouble with the local authorities. "The government over there is a bad government," he says. "They can make you disappear." For more information about the Heimlich Institute's notorious "malariotherapy" experiments on AIDS patients, check out these recent articles that resulted from research by me and Karen. 2) Here's another Rotary connection. “So far, there has been no institutional memory or documentation of this research. However, the Ministry of Health will continue to probe into this alleged project." 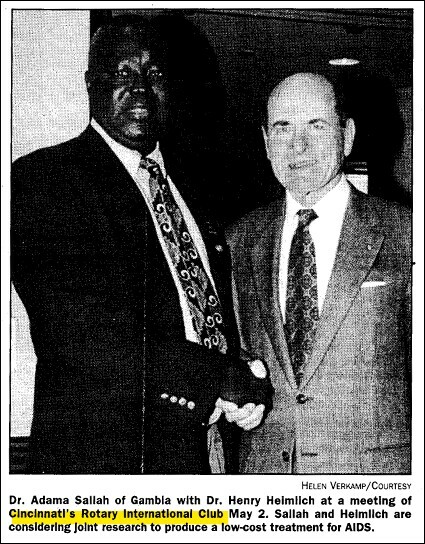 Click here to download a 156-page pdf of the documents from the Henry J. Heimlich Archival Collection at the University of Cincinnati that include the protocol and financial records showing that, after being rejected by Cincinnati's Deaconess Hospital, the Barbados study was funded by the Rotary Foundation of Cincinnati (and the Heimlich Institute). As far as I know the Barbados Ministry of Health's investigation is ongoing. The "malariotherapy for AIDS" and "Heimlich maneuver for asthma" experiments couldn't be conducted in the United States because they violate U.S. laws protecting the rights of human beings used as research subjects. How many other human experiments that would be illegal in the United States and other industrialized countries have been or are currently being funded by Rotary? Does Rotary International have any policy in place to prohibit funding or participation by members in such medical experiments ? If not, why not? If you've got any related information to share, click here to e-mail me.